I commented earlier on the way in which schools in England are assessed, which is still dominated by high stakes SATs exam testing, even at Primary School Key Stage 2 level (11 year olds) — the sector in which I’m most involved. The new controversial Ofsted inspection regime has recently got tougher, with a continued emphasis on SATs attainment levels, and even more precisely defined criteria, with many schools finding themselves demoted in the categorisation scheme. You really have to tick every single box to get a given grade: it’s not a ‘best fit’ match. Having just experienced the new inspection regime at Bushfield School where I am Chair of Governors, I’m afraid I can confirm that it is a gruelling affair for staff, due to the level of detail and questioning required to test all the criteria — when in a school for only 1.5 days to judge it. All I’ll say is that when Headeachers are professionally tarred, feathered, and made redundant if they don’t get a ‘failing’ school improving (as defined by Ofsted) we do not exactly have a culture conducive to learning and professional development. (We used to do that to children too, but it’s the 21st Century now so we know how destructive that was…). However, I can report a few glimmers of hope, one regarding the explicit success criteria, the other on the impact of intensive, explicit focus on fostering learning to learn habits of mind and skills. 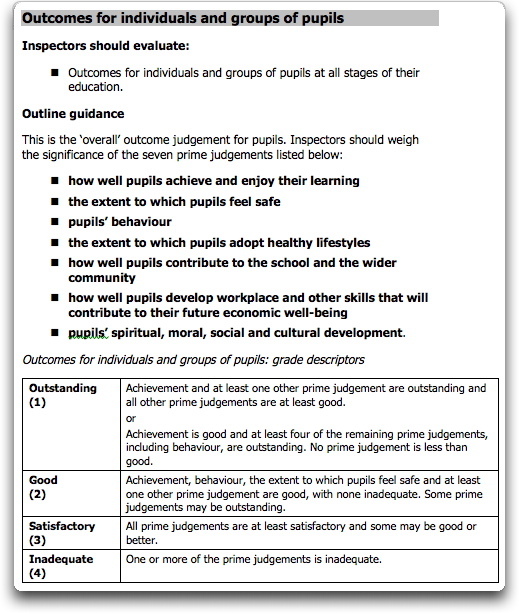 First, the criteria for being deemed “Outstanding” overall have broadened a little, and do not appear to be so dependent on having “Outstanding” exam attainment levels which are incredibly hard to achieve in areas of special economic need, with all the additional challenges that brings. Academic “achievement” now can be “Good”, if at least four other primary judgements are “Outstanding” — see p.82 below of the hefty evaluation schedule). This is progress of sorts, and it now appears that Leadership can now be deemed “Outstanding” even if academic “Achievement” is not. The fact that Leadership might be “Outstanding” even in a severely depressed locale in which academic attainment measures struggle, seems not to have penetrated yet. The second area of hope is in relation to the importance of meta-cognition, habits of mind, and learning skills. We care deeply about switching our young people onto learning — fostering their curiosity, their appetite and capacity to question and to figure out how to get answers, and so forth. The framework we use at Bushfield is based on the formative work at University of Bristol on Learning Power, by Guy Claxton, Patricia Broadfoot and Ruth Deakin Crick. Bushfield has been implementing the Building Learning Power strand of practitioner development resources that came from this research, and is now considering adding in the Effective Lifelong Learning Inventory (ELLI) as a way to personalise and track progress, working with the ViTaL social enterprise. (Open U. has already been piloting ELLI in the ELLI for Adults programme led by Chris Edwards, and I’ve brought it into my research on social learning and sensemaking). Deakin Crick, R., Broadfoot, P. and Claxton, G. (2004). Developing an Effective Lifelong Learning Inventory: The ELLI Project. Assessment in Education, Vol. 11, Issue 3, pp. 247–272. These successive statistical operations enabled us to identify what we believe to be some key components of learning. Detailed scrutiny of the loading of the items on the seven factors led to these dimensions being interpreted in terms of the following summary descriptions that are presented in a polarized form here for the sake of clarity. It needs to be stressed, however, that it is important to recognize that these are ‘ideal types’ in that any individual learner is likely to find themselves at different points on each dimension. Moreover, as has been suggested, an individual’s position between the two poles identified for each dimension is likely to vary from time to time and from context to context. At this stage of the analysis the emphasis was on identifying in a robust way the dimensions themselves, rather than the capacity of the scales to characterize particular individuals. Some learners appear to regard learning itself as learnable. They believe that, through effort, their minds can get bigger and stronger, just as their bodies can. They see learning as a lifelong process, and gain pleasure and self-esteem from expanding their ability to learn. Having to try is experienced positively: it’s when you are trying that your ‘learning muscles’ are being exercised. A growth orientation includes a sense of getting better at learning over time, and of growing and changing and adapting as a learner in the whole of life. There is a sense of history and hope. The opposite of growth orientation is fixity. Other learners appear to believe that the ability to learn is fixed. They therefore experience difficulty negatively, as revealing their limitations. They are less likely to see challenging situations as opportunities to become a better learner. Some learners manifest a desire to find things out. They like to get below the surface of things and try to find out what is going on. They value ‘getting at the truth’, and are more likely to adopt ‘deep’ rather than ‘surface’ learning strategies. They are less likely to accept what they are told uncritically, enjoy asking questions, and are more willing to reveal their questions and uncertainties in public. They like to come to their own conclusions about things, and are inclined to see knowledge as a product of human inquiry. They take ownership of their own learning and enjoy a challenge. The opposite pole is passivity. Passive learners are more likely to accept what they are told uncritically, and to believe that ‘received wisdom’ is necessarily true. They appear to be less thoughtful, and less likely to engage spontaneously in active speculation and exploratory kinds of discussion. Some learners are on the lookout for links between what they are learning and what they already know. They get pleasure from seeing how things ‘fit together’. They like it when they can make sense of new things in terms of their own experience, and when they can see how learning relates to their own concerns. Their questions reflect this orientation towards coherence. They are interested in the big picture and how the new learning fits within it. They like to learn about what really matters to them. The opposite pole is fragmentation. Some learners are more likely to approach learning situations piecemeal, and to respond to them on their own individual merits. They may be more interested in knowing the criteria for successful performance than in looking for joined-up meanings and associations. Dependent and fragile learners are more easily disheartened when they get stuck or make mistakes. Their ability to persevere is less, and they are likely to seek and prefer less challenging situations. They are dependent upon other people and external structures for their learning and for their sense of self-esteem. They are passive imbibers of knowledge, rather than active agents of their own learning. The opposite of dependence appears to be resilience & robustness. Learners with these characteristics like a challenge, and are willing to ‘give it a go’ even when the outcome and the way to proceed are uncertain. They accept that learning is sometimes hard for everyone, and are not frightened of finding things difficult. They have a high level of ‘stickability’, and can readily recover from frustration. They are able to ‘hang in’ with learning even though they may, for a while, feel somewhat confused or even anxious. They don’t mind making mistakes every so often, and can learn from them. Those learners who score highly on this dimension are able to look at things in different ways. They like playing with ideas and taking different perspectives, even when they don’t quite know where their trains of thought are leading. They are receptive to hunches and inklings that bubble up into their minds, and make use of imagination, visual imagery and pictures and diagrams in their learning. They understand that learning often needs playfulness as well as purposeful, systematic thinking. The opposite pole is literalness or rule boundness. These learners tend to be less imaginative. They prefer clear-cut information and tried-and-tested ways of looking at things, and they feel safer when they know how they are meant to proceed. They function well in routine problem-solving situations, but are more at sea when greater creativity is required. Learners who score highly on this dimension are good at managing the balance between being sociable and being private in their learning. They are not completely independent, nor are they dependent. They like to learn with and from others, and to share their difficulties, when it is appropriate. They acknowledge that there are important other people in their lives who help them learn, though they may vary in who those people are, e.g. family, friends or teachers. They know the value of learning by watching and emulating other people, including their peers. They make use of others as resources, as partners and as sources of emotional support. And they also know that effective learning may also require times of studying—or ‘dreaming’—on their own. The opposite pole is dependence. Some learners are more likely to be stuck either in their over-dependency on others for reassurance or guidance; or in their lack of engagement with other people. These have since been validated with many other cohorts, and distilled into practitioner training and resources. The ELLI tool reflects back to a learner how they perceive themselves as learners against the seven dimensions, using a visual spider diagram — the basis for mentored conversation. The BLP programme summarises them as four R’s (Resilience, Resourcefulness, Reflection, Reciprocity) which are unpacked into sets of “learning muscles” (introduction by Guy Claxton for QCA) that staff and learners then work on strengthening, e.g. managing distractions, questioning, distilling, empathy. “The school has made outstanding progress in a short length of time […] The progress of both teachers and pupils was impressive to observe and represents the most profound change I have recorded to date. The school’s commitment to infusing the principles and practice of building pupils’ learning capacities was observable in all lessons, in teacher planning, in teacher talk, and in pupils’ perceptions of learning. …and leave with “a strong set of higher-order skills to sustain them for a lifetime of learning”. Clearly, not everything is simplistically attributable to learning to learn skills and dispositions, e.g. there is a deep, rich skillset around teaching and tracking literacy and numeracy which must be in place for those indicators to go up. However, it is in the creation of a learning culture amongst both staff and pupils, who are all trying to stretch their learning muscles, and who are given permission and autonomy to explore new ideas, that learning power provides a language in which to reframe what it is we think we’re about. I’m excited at what lies ahead as we seek to embed these ideas in social media for inquiry and sensemaking.